A ribbon-cutting ceremony is planned for August 10th, 2:00 p.m., at the Acton end of the Assabet River Rail Trail. Mass Department of Transportation (MassDOT) Secretary/CEO Stephanie Pollack will join state and local officials (not yet named) at the event. If the weather is nice, consider walking, running or bicycling to the site. Mileage markers are in place. Maynard’s start at the Stow/Maynard border (White Pond Road), at 0.0 miles. The last in Maynard reads 2.25. And then, 100 yards farther, is the Maynard/Acton border with a 0.0 stone to indicate the start of the Acton section. Combined length 3.4 miles. 1992-2002: The idea of converting 12.5 miles of obsolete railroad right-of-way into a rail trail was first conceived by local activists in 1992. The catalyst for this was several federal laws, including the National Trails System Act, that had led to the creation of more than 600 rails-to-trails conversions by 1994. Locally, the Assabet River Rail Trail as an organization was established in 1994 with Jeff Richards as president and Duncan Power as secretary (a role Duncan still holds to this day). Thomas Kelleher succeeded Richards as president in 2001 and still holds that position to this day. Over the years, feasibility studies led to engineering surveys led to federal and state and town funding. A key milestone was the transfer of the right-of-way from the MBTA to towns, in 2002. 2003-06: Construction initiated on the 5.8 mile, Marlborough/Hudson portion of the Trail; completedBoston, so together they could start up a carpet mill on the Assabet River. Route 62 and the Rail Trail. 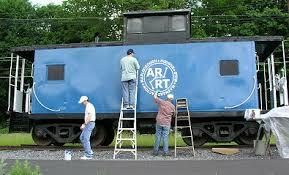 2006-2016: Volunteers belonging to the ARRT organization (www.ARRTinc.org) met almost monthly, and often conducted group efforts to maintain the paved portion and improved the northeast end to a point where it could be hiked or bicycled. In Maynard, where rails were still in place, volunteers filed between the rails with wood chips so as to make a packed, level surface, much preferred to trying to walk, run or ride on the exposed railroad ties. 2016-18: At a July ground-breaking event held in Maynard, construction of the 3.4 mile, Maynard/Acton portion of the trail was officially started, completed August 2018. There was a delay (and additional cost, borne by Mass Dept Transportation) to remediate contaminated soil on the section north of Concord Street. Final landscaping is a work in progress. Tree and shrub planting has been nearly completed, but a few of last year’s plantings did not survive the winter and will be replaced. ‘ARRT-north’ offers a boardwalk and two bridges, transit through the center of Maynard, and a north terminus at the South Action train station. Going forward, the towns will have to decide what level of maintenance is needed, whether to snowplow in winter, and also whether to install amenities such as benches and trash receptacles that were not part of the original project. Future/National: The Rails-to-Trails Conservancy (RTC), a non-profit organization promoting trail creation and use, estimates that there are currently more than 30,000 miles of trails in the United States, with an additional 8,000 miles under consideration. RTC (www.traillink.com) lists 82 trails in Massachusetts, ranging in length from 0.1 to 38 miles. Future/Local: A proposal has informally been made to the Town of Maynard to make the town’s portion a “Trail of Flowers” by having volunteers plant flowering bulbs, mostly daffodils and tulips, alongside suitable portions of the Trail. Each fall would have a weekend or two designated as bulb-planting weekend. Volunteers would coordinate where to plant (sites first OK’d by Town). The idea is to add beauty to the Trail, for the enjoyment of residents and visitors.